The UL-101 is an early warning system for detecting facility defects at a very early stage – before the damage occurs. The UL SERIES ULTRASONIC DETECTORS are designed for the Rapid, Reliable and Cost-Effective detection of seal failures and minute leaks within compressed air systems and networks, vacuum systems, industrial equipment and machinery. Predictive & systematic repairs can avoid expensive disturbances and unscheduled downtime. Identifying the exact location of a defect entails a quick reaction time to prevent major damages. With UL-101 it is possible to locate precisely the defects and estimate their magnitude. Its fast and easy operation can save time, material, energy and condensate losses with a regular checking of fittings, valves and gates, steam trap, ball bearings. The regular inspection of engines, pumps and gears using UL-101 leads to increased operational reliability and guarantees a higher degree of availability of machinery. With the monitoring and study of the flow noise, the inspection of the leak tightness of valves, slide valves and steam traps is also possible. Compressed air is an environmentally conscious form of energy. However, leakages within the system usually expand quickly and increase your long-term energy costs. Detecting sound emissions in the ultrasonic frequency range caused by compressed air leakages and electric partial discharges over longer distances reliably and precisely is possible with the parabolic probes. Practical experiences show that periodic removals of Leaks in compressed air systems reduce the energy costs by up to 30%. Defect-induced noises and wear-tear to various machinery components and rotating machinery can be recorded electronically. In addition to all individual and serial testing procedures, all irregularities can be transferred to a PC online and presented and archived in graphic and tabular format. An optional integrated data logger enables the rapid transfer of data between the device and your computer via a USB interface. Ultrasound is generated due to friction caused by the flow of gases, liquids and solids in pipes and leakages. These signals are processed by the UL-101 and their intensity is displayed on the display screen as well as made audible through speakers or headphones. This data can be stored and transferred to the computer using the integrated USB interface for further analysis. 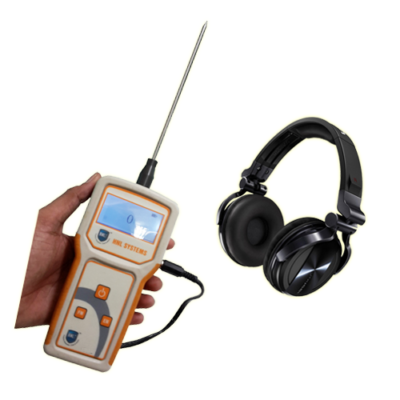 The UL-101 can be used to detect leaks in pressure-less systems, such as vehicles, freight containers, other types of containers and ventilation technique systems, where no ultrasound is generated. The UL-101 generates ultrasonic waves which emerge at the leak points. The precise location is carried out from the outside with the UL-101. The option of an additional ultrasonic transmitter allows the control of the leak tightness of windows, doors, cabins and devices with little additional expense.